A simple and memorable recipe for Brown Sugar Dijon Pork Tenderloin. Just two simple ingredients to create a meal your family will rave about! Easter will be coming up shortly. Have you thought about what you’ll be making for Easter dinner? I’m going to prepare this Brown Sugar Dijon Pork Tenderloin. (Brown Sugar Chicken would also be delicious!). This year will be the first time in six years that I’ll be able to spend Easter with my extended family. It’s nice to be closer to everyone and I’m looking forward to sharing a meal with my loved ones. Preheat oven to 400F. Season the pork tenderloin with salt and pepper on both sides. Heat olive oil in a skillet over medium heat. Add pork tenderloin and brown, about four minutes per side. Remove from heat. 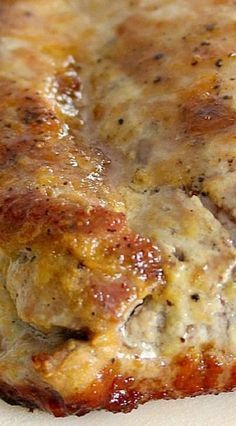 Place pork tenderloin in an oven proof pan. Brush the entire pork tenderloin with French’s Dijon Mustard. Then sprinkle the pork tenderloin with brown sugar all over and press gently with your fingers to make it absorb in. 0 Response to "Brown Sugar Dijon Pork Tenderloin"